And now we get to talk about Sequelitis. 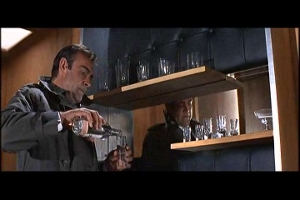 You’d expect the fifth Bond movie to bear some resemblance to its predecessors, but You Only Live Twice can’t seem to help calling attention to its heritage. Personally, I blame Roald Dahl. He should’ve turned this project down from the start. He and Ian Fleming were apparently good friends in real life, but their writing styles couldn’t be further from each other if you placed them on opposites sides of the cosmos. Dahl hated the novel that shares this film’s title and, twenty-one years after the film premiered, flat-out admitted to Starlog magazine “I didn’t know what the hell Bond was going to do.” Producers Albert Broccoli and Harry Saltzman answered by giving him The Formula, whole and (more or less) complete by 1966, at the latest. The best ideas in this film? Stealing shots from the original. These Slasher sequels are supposed to be simple. Trot out a brace of clay pigeons, watch them all die one by one, tack on some stupid cliffhanger, and you’re all good to go. It seems impossible to screw that up, but by God, Mustapha Akkad found a way. Several, in fact. 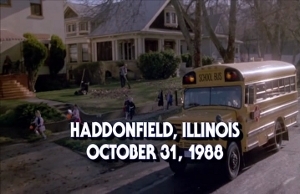 The first, Halloween 4, was a complete waste of its own potential, meant to compete with the other Big Names in this sub-genre by copying all their worst eccentricities. By 1989, the Friday the 13th and Nightmare on Elm Street films had long-since surpassed the original Halloween in the popular imagination. They (rightly or not…mostly not) were synonymous with American horror movies of the late-80s, leaving their mutual progenitor in the box office dust. Thank God…I was completely adrift, myself. In all the history of cinema, Godzilla and Star Trek stand alone as the only franchises in history who’ve managed field strong fourth films (Mothra vs. Godzilla and The Voyage Home, respectively – though this feels like an invitation for everyone to “well, actually” me). One day they will do epic battle for the hearts and souls of nerds the world over. But until then we, their partisans, must content ourselves with taking the piss out of other, less-fortunate film series. "Um...line...? HA! Had you going, didn't I?" And here we have a film never should’ve seen the light but, like that three-car pile-up on your way to work, resolutely sits right in the middle of the road refusing to be ignored. The same way most critics ignore John Carpenter’s made-for-TV movies. 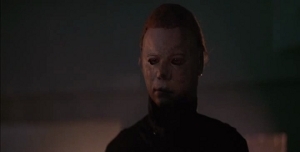 It’s easy enough to review Halloween. Just prattle on about how scary and haunting adjectival it all is given that twenty years of increasingly-mechanical slasher films have done absolutely nothing to diminish Halloween‘s overall effectiveness. Nothing at all. Do you hear? Rather like I attempted to do in my original review of the film, which appeared somewhere very much like this space way back in the dark, dial-up days of 1999. Don’t look for it: I’ve not touched the thing since I originally put it up, and I’d just as soon it ceased to exist. Bloody Wayback Machine.